The 2018 season probably could have gone worse for the Cardinals, but it would have involved either Bane or a teamwide staph infection. As it was, the Cardinals put up their fewest points since 2000. They won only three games, including only one against not-the-49ers. 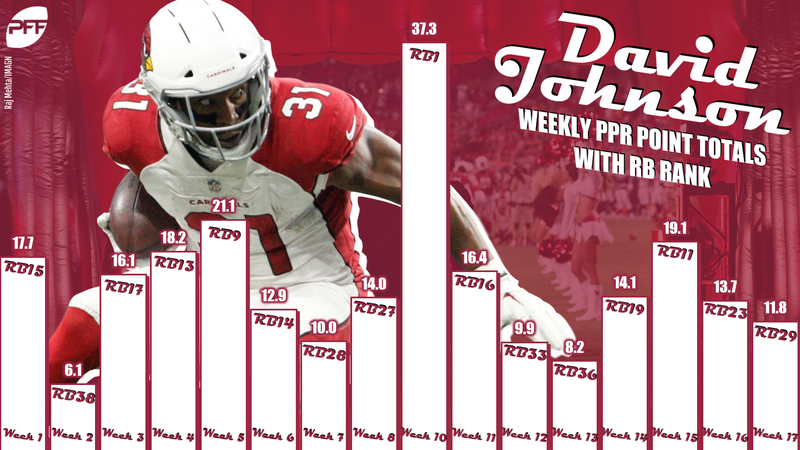 Josh Rosen couldn’t even manage 10 fantasy points a game as a rookie, and while David Johnson did finish the year as the No. 9 PPR running back, you wouldn’t be wrong to call him a disappointment anyway — he achieved his end-of-season total in true Frank Gore-ian fashion, with only two weeks as a top-10 back (only one above ninth) and eight different weeks between 11th and 23rd. The Cardinals have a new coach in 2019 in Kliff Kingsbury and the first overall pick in the draft, but there is a lot of work in Arizona before the team can start to think of itself as a contender or a fantasy-relevant franchise. Here are the moves we’d like to see the most this offseason from a fantasy perspective. Nick Bosa (or whoever Arizona would select first overall) would likely be a great addition. But as mentioned above, the Cardinals have far too many areas of concern to hitch their saddle to one player at first overall when they could instead revamp more of their roster with a trade-down. Take the lead the Colts set in 2018, when they traded the third overall pick to the Jets and in return got the sixth (Quenton Nelson), 37th (Braden Smith), and 49th (traded again to eventually end up as Kemoko Turay) picks, plus an extra second-rounder this year. That trade along helped make the Colts the contenders they were in 2018. While the Cardinals aren’t as close as those Colts were, and there might not be quite that level of return available to Arizona, there is still more appeal to several picks rather than one player who could be a game-changer in one department for a team whose game needs to change in several. My preference for the Cardinals in this draft is JJ Arcega-Whiteside, but really, the Cardinals just need to bring in some kind of receiver who can stretch the field instead of another guy who can be a displaced slot receiver like Christian Kirk alongside the now-returning Larry Fitzgerald. Whether that is Arcega-Whiteside is less relevant than that it is someone to give Rosen a new target. There is no Andrew Whitworth or Andrew Norwell or any other neat O-line Andrew in this year’s free agency class, but Rodger Saffold, Jared Veldheer, and plenty other names are available, and the Cardinals have the eighth-most cap space. Between that and the potential picks they should trade down to acquire, the team should bring in as many potential offensive line contributors as it can fit on its roster, because things were bad in 2018. The team had the worst pass-blocking grade (55.9) in the league last year and a bottom-tier run-blocking grade (55.8) to go with it. Rosen was pressured on more than 40% of his dropbacks and had a league-low 38.1 passer rating on those pressures (all incompletions would be a 39.6). If the team wants to salvage Rosen’s stock after a really down rookie campaign, it needs to protect him worlds better than it has so far.